Do you have baby and toddle clothes and gear that you’re not using? Consider donating those unused items to HOPE! All donated baby and toddler items go into our Baby Boutique to assist clients and community partners. We will never sell you donation, so you can be sure that your gift will go to a family who might not otherwise be able to afford it. 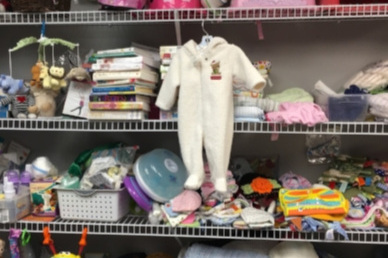 HOPE accepts boys and girls clothes from preemie to 5t, blankets, diapers, wipes, maternity clothes and all baby gear except recalled items and used carseats. All donations to HOPE are tax-deductible, and we’re happy to provide a receipt at the time of donation. If you have questions about how, where, or when to donate, please call 505-662-2300.
every time you shop on Amazon, make sure to use the url smile.amazon.com. Running an office and providing client services requires a surprising amount of supplies! HOPE’s Amazon Wish List contains items that are needed to help the office run. To donate items from HOPE’s wish list, visit http://a.co/4FtZCYn. Make sure that a receipt with your contact information is sent to our office so that we can thank you and provide a tax receipt! The Thrivent Choice program gives eligible members of Thrivent Financial the power to recommend where some of the organization’s charitable outreach funds are distributed annually, using a vehicle called Choice Dollars®. Since its inception in 2010, Thrivent Financial has provided more than $370 million in charitable outreach funds through the Thrivent Choice program to help support the initiatives of churches, educational institutions and other nonprofit organizations, including HOPE. To learn more about the Thrivent Choice program, visit https://www.thrivent.com/making-a-difference/living-generously/thrivent-choice/. Interested in creatively supporting HOPE in other ways, such as adding HOPE to your estate planning? Call us at 505-662-2300 or email director@hpcla.org.